For current information, please visit our renewed website! 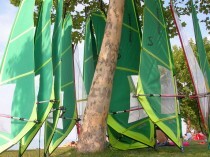 Learn with us to windsurf, at Zamardi on the southern coast of lake Balaton! The water depth and the general wind directions provide you a prime setting for the first wingflaps. 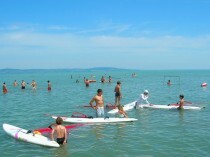 The surf school is located in the center of the free beach of Zamardi. -it is just enough to give you a taste in the basics in theory and practice, but you can gauge your skills and decide if you would like to continue. -mastering the theory and practice, getting to know the basic maneuvers on the simulator and on water as well. 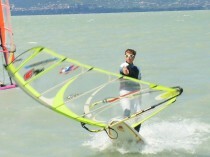 -learning the full material of the Basic Surfer's Course of VÖWS, the Association of Windsurf Schools of Austria. This comprises of the main maneuvers on water, understanding the theory behind sailing, assembling your own equipment, handling emergency situations, understanding weather. After finishing the 10 hours course you can enroll on the exam for the Basic Surfer's Certificate of VÖWS, which is accepted and valid in whole Europe. This certificate can be used if you want to surf on seas or oceans.